BELFAST, NORTHERN IRELAND , 2017-Sep-11 — /Travel PR News/ — Armagh-based Long Meadow Cider has been awarded an exclusive craft cider contract in the Bushmills Bar at George Best Belfast City Airport. The Bushmills Bar and the recently rebranded St. George’s Market restaurant in the airport, both managed by HMSHost, will both stock the award-winning Blossom Burst flavour. “The first order was placed in mid-Summer with a second, larger, order placed the following week, and we believe this contract has the potential to be our biggest. “Bottled cider is consistently one of the most popular selling bottled, alcoholic products in the Bushmills Bar and St. Georges Market at Belfast City Airport. “At Belfast City Airport, we are passionate about championing and supporting local brands. “Our search for Northern Ireland’s ‘Best’ local food and drink product in partnership with Food NI earlier this year allowed us to provide the winner, Long Meadow Cider, with £30k of on-site advertising and marketing support to promote its brand to our 2.7million passengers each year. 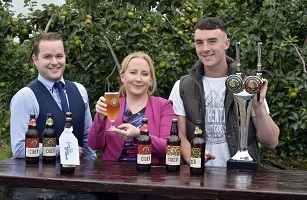 “The Belfast City Airport and Food NI competition was a fantastic platform for local food and drink producers from Northern Ireland, and the prize for Long Meadow Cider, which sees the brand promoted on a huge lightbox at the entrance to the airport, is a huge boost for the company. This entry was posted in Airports, Food & Drinks, Travel and tagged Alex Woodhouse, Bushmills Bar, George Best Belfast City Airport, Joanne Deighan, Long Meadow Cider, Michele Shirlow, Peter McKeever. Bookmark the permalink.